Beginning a new month. June. Last month of the school year. Bumble bees are singing happy songs. Plans for July and August are discussion topics. Tomatoes are planted, kale is growing, the beans look a bit stressed. 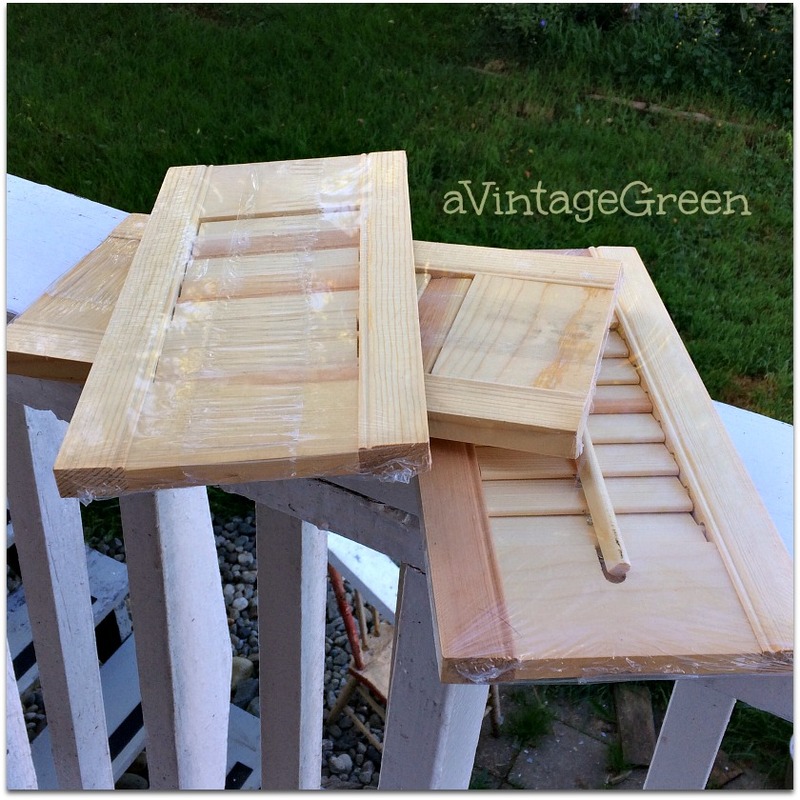 I found 3 small shutters last weekend at my favourite church sale, shutters still in their plastic wrap. 3 coats of CeCe Caldwell Simply White. 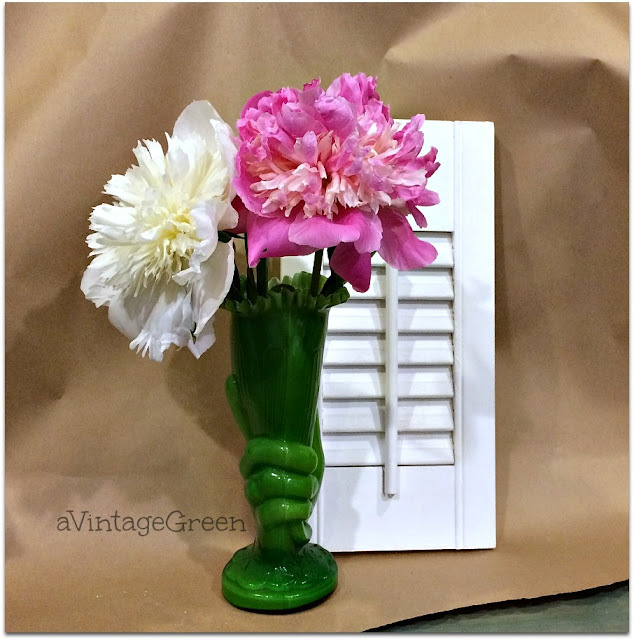 The shutters will make great for background for photos. It takes hours to paint shutters (feels like hours, likely was about 1 hour with lots of drying time). Stencilled Dream Believe Hope in pink. Could not resist adding the battery operated lights to a vintage jar. Picked the two peonies that have bloomed and one iris. 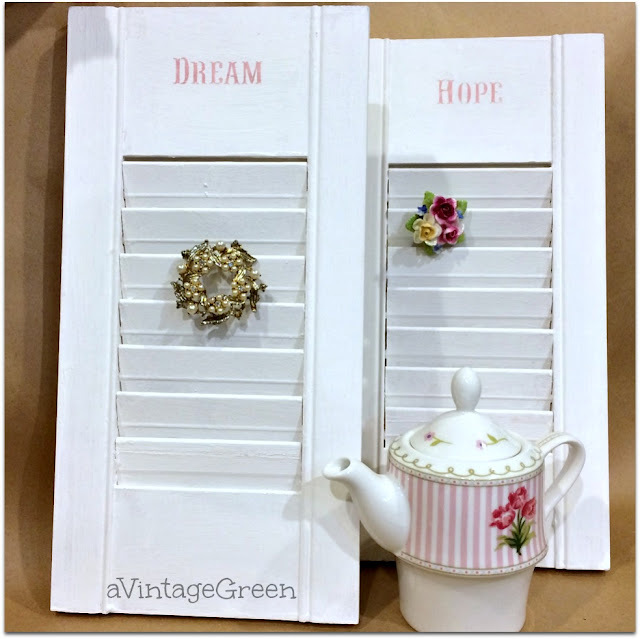 The small shutters would be useful holders for vintage broaches. The reverse side of the shutters are plain white. The peonies opened up overnight and smell so sweet. I am posting again tomorrow afternoon at 5:00 pm for those who want to visit again this week. I love the shutters and how you repurposed them. I am looking for some larger ones for a project. I'm going to try the Habitat ReStore. Thanks for the sweet comment on my latest post. Your comment didn't arrive in my mail and I can't reply from my post. - Oh, the woes of technology! I love shutters and these are darling. Have a great weekend. This is a beautiful piece Joy. Gorgeous shutters! Thank you for including this at: #blogginggrandmotherslinkparty. We greatly appreciate your participation. I have shared this on my social media. Very nice, Joy. I love peonies--nice touch. Thanks for linking up at #BloggingGrandmothersLinkParty. What a fabulous idea! Love the shutters, so pretty. White is my favorite color. Funny how time shifts when you are doing monotonous painting and an hour feels like forever! Totally worth it though, these look great. Doggone it! I just saw shutters at a yard sale - I know I should have bought them!! Oh well, I'll be watching for some now - Thanks for sharing at the Pleasures of the NW's DIY link party! Joy, What lovely shutters. Great backdrops. I am waiting for the peonies to open. It is getting close. Thanks for sharing. Sylvia D.
The shutters are very nice! Great use! Happy Monday! What a fun display! Was the Ce Ce paint easy to use? What a great find, the shutters look great thanks to your talented touch, could they be used a letter racks do you think? Gorgeous peonies, too. 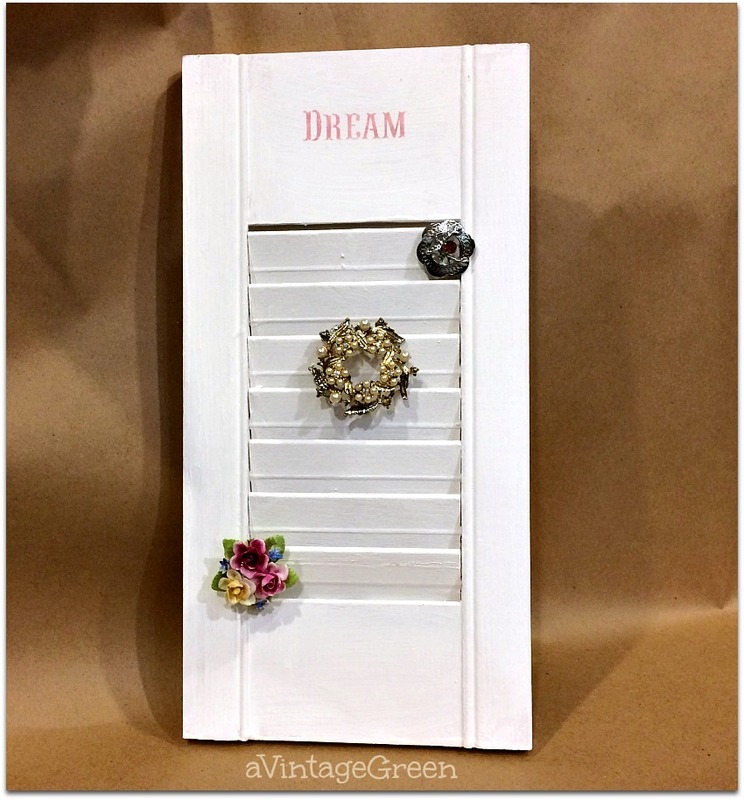 Shutters are so great! Thank you for sharing at Home Sweet Home! These turned out great and are going to be great backdrops for future pictures. You have given me an idea. Thanks for linking up at #BloggingGrandmothersLinkParty.I am sharing on social media. So adorable! Thank you for sharing your creativity in the GRAND Social linky. Love 'em! 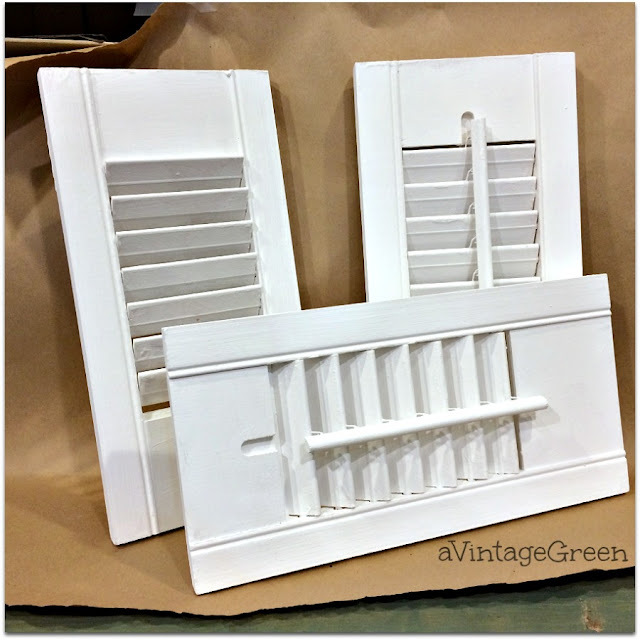 Joy - these shutters reminded me how much I like looking at displays in antique stores and other fun places. Quite often the display 'methods' are more interesting than what is being shown! I think this could be a great way to display Christmas cards that we will receive, especially the flat ones that don't stand on their own! What a pretty way to repurpose those shutters, Joy! Thanks for sharing them at Talk of the Town. What a great find at the church rummage sale. 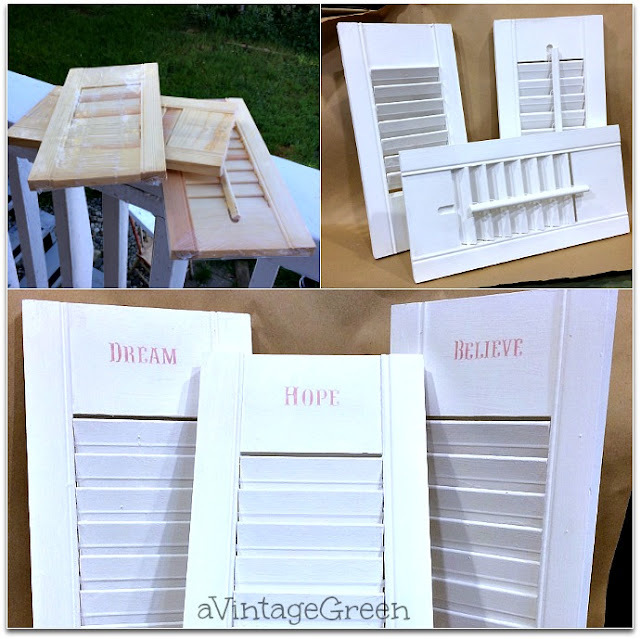 You'll use these shutters a million different ways in vignettes throughout your home. The labor of painting 3 coats on the shutters (ugh) will be rewarded many times over. What a great idea! I love these! 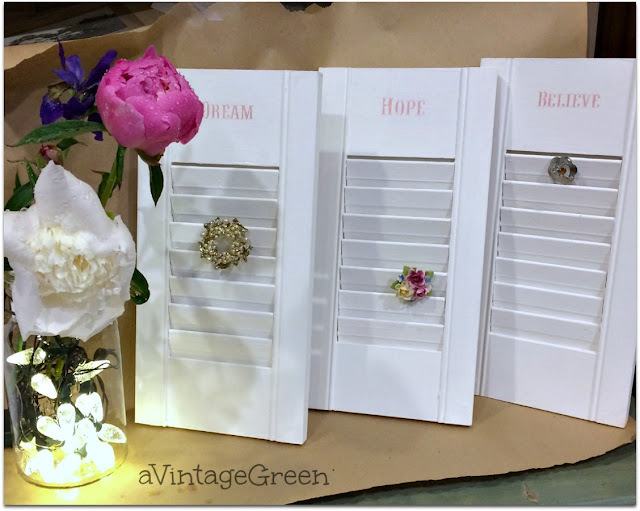 I might have to find some shutters now and try this out! Thanks for sharing! They look very nice! Thanks Joy for linking up at the #BloggingGrandmothersLinkParty. I shared on Pinterest. This was a great find and I love how you repurposed them. The brooches are a very pretty accent. Thank you for sharing with us at Celebrate Your Story, and I hope you’re having a great weekend. Oh these are just adorable and easy to make. Thank you for linking up and sharing with us at #BloggingGrandmothersLinkParty. I've shared on social media and hope to see you next month. very cute! I love them as a broach holder :) Thank you for sharing with us at Create and Celebrate!